There remains a moral high ground in American politics, and on Thursday Michelle Obama spoke from it. In so doing she provided precisely the clarity that has been needed to raise the quality of the discourse that Donald Trump has so damaged. It was necessary for Obama to put aside the “normal campaign speech” she was prepared to deliver Thursday on behalf of Hillary Clinton’s campaign in the battleground state of New Hampshire. It was necessary that she address the topic that has transfixed American politics since last Friday: Republican presidential nominee Donald Trump’s predatory bragging, on a 2005 tape, about how powerful men “can do anything” they want to women. Though the first lady does not mention Trump by name when she speaks on the 2016 campaign trail, she consistently calls out his excesses and abuses. 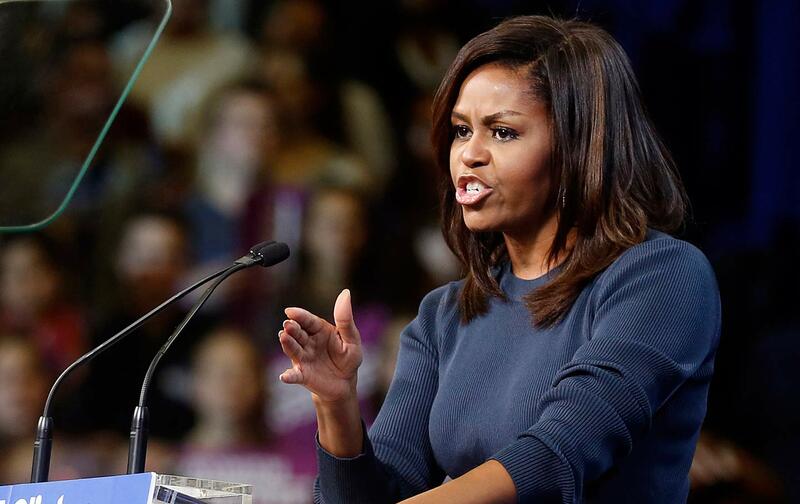 And the latest excesses and abuses needed to be addressed — as only Michelle Obama can. Since she electrified the Democratic National Convention with a powerful rebuke to the Republican nominee’s cruel and unusual politics, Obama has emerged as the single most effective critic of the Trump debasement — and the single most effective advocate for Clinton’s candidacy. But the address the first lady delivered in Manchester Thursday was more than just another campaign speech. This was a heartfelt plea for America to stop and think about what has happened to our politics. It’s not something we can just sweep under the rug as just another disturbing footnote in a sad election season. Because this was not just a “lewd conversation.” This wasn’t just locker-room banter. This was a powerful individual speaking freely and openly about sexually predatory behavior, and actually bragging about kissing and groping women, using language so obscene that many of us were worried about our children hearing it when we turn on the TV. Michelle Obama spoke a truth that must be recognized, and embraced, by everyone who cherishes the American experiment. “This is not normal. This is not politics as usual. This is disgraceful. It is intolerable. And it doesn’t matter what party you belong to—Democrat, Republican, independent—no woman deserves to be treated this way. None of us deserves this kind of abuse,” Obama said.